Every company claims that their system has the best countertop water filter in the market. You are overwhelmed by the selection and mixed review that was given by the existing customer. So, what are the criteria for selecting a great system? What Is The Best Countertop Water Filter? 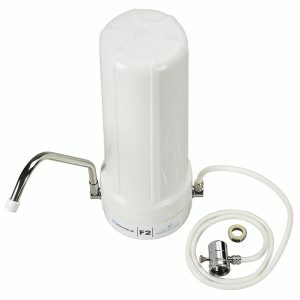 There are so many countertop water filters on the market. After a thorough review of each of them, we have selected a few of the well-known ones for comparison. Let’s compare some of the top water filters in this category. + Removes fluoride, chlorine, arsenic, VOC. + 5 Stage Alkaline Remineralization Filter. + Removes 99% contaminants including pathogenic bacteria. + No Maintenance for up to 7 years. Most of this type of water filters are single filter cartridge due to space saving purpose except for the APEC RO-CTOP. Installation is quite simple for all of the filters above. What distinguishes each of them is the capacity and technology that was used to build the water filter. The longer the filter is able to withstand the dirty source water, the better the technology of the company. All the systems above look more or less the same. However, each of them has their own unique selling point. Based on all the information above, here are the few winners that are on top of the list. 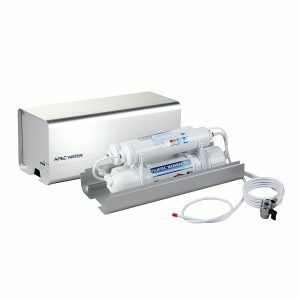 APEC RO-CTOP is one of the few over the counter filtration system with reverse osmosis capability. Below are the three reasons why this is our top-rated countertop filter. 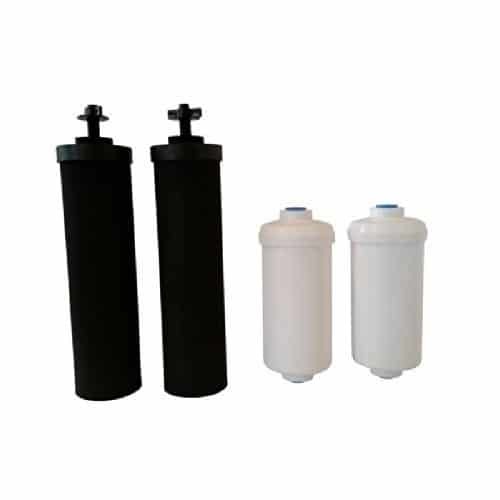 Traditionally reverse osmosis filter comes with a bulk storage tank due to the flow rate is low. In order to remove the storage tank, APEC increases the flow rate of RO-CTOP to 90 gallons per day. The flow rate capacity only appears in the top tier products which are priced close to $300. The APEC RO-CTOP is really a good bargain. APEC claimed that the RO-CTOP is capable of removing 99% of harmful contaminants and provide an excellent filtered water quality. It is 4 stages reverse osmosis water filter which contains a sediment filter, a pre-carbon filter, a reverse osmosis membrane, and a post-carbon filter. 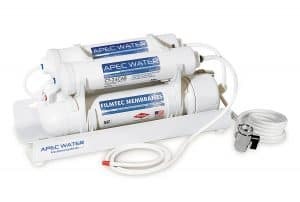 The APEC RO-CTOP doesn’t require complicated installation like other reverse osmosis filters. Just screw on the faucet adaptor and you are good to go. Unlike other water filters, the APEC RO-CTOP required no wrench for replacement. It comes with a Quick Connect capability by inserting or releasing the tubing for replacement. + Pack with a 4 Stage Reverse Osmosis System. + Remove up to 99% of the contaminants in the water. + Reasonable annual replacement cost for such a great system. + High Flow rate compared to other reverse osmosis systems. + Suitable for well water and city water source. Bottomline: The APEC RO-CTOP combines the benefits of reverse osmosis and the portability of countertop water filter. Hence, it is our No.1 RECOMMENDED. For a more in-depth analysis, kindly visit our detailed review page of this filter. With the patented 10 stages water filter cartridge, the New Wave Enviro is no doubt in our recommendation list. Many customers gave a thumbs up on this New Wave Enviro 10 stage water filters although there isn’t any certification from NSF or WQA. 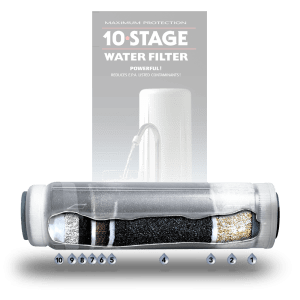 This 10 stages filtration system will require a replacement approximately once a year. This shows that the filter is built with high quality to withstand contamination while maintaining the quality of the water. + Long filter lifespan translate to great technology. + Patented 10 stage filter in one cartridge. + Low annual maintenance cost. – No certification from NSF or WQA. Bottomline: This system is one of a kind countertop water filter which is stylish and effective in removing contaminants. If APEC CTOP is out of your budget, this is the perfect one for you! 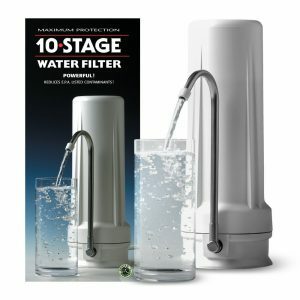 New Wave Enviro 10 Stage Water filter. To find out more about this filter, click here to view our detailed review. CleanWater4Less Water Filter is undoubtedly the most cost-effective filter that we have on the market. This filter has a lifespan of 10,000 gallons of water which translate to about 7 years of usage for a family of 4 that uses 1500 gallons per year. 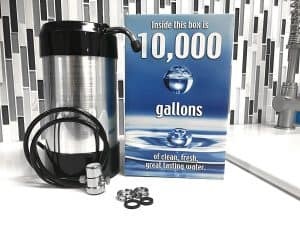 It is extremely affordable and you have no reason not to get rid of your ineffective water pitcher and get the CleanWater4Less water filter. The 5 stage CleanWater4Less water filter is capable of removes odor and taste from chlorine, radon, VOC and heavy materials from the water. Those are the main components of contaminants. It comes with a high-grade GAC filter alongside two stages of pre-filters and two stages of post filters. + No replacement needed for up to 7 years. + Suitable chlorine treated city water source. – No warranty stated by the company. – Unable to estimate when to replace the whole unit. – Doesn’t publish on how well does it filter contaminants. Bottomline: Overall is the cheapest among all the system in the long run due to $0 maintenance for 7 years. Replace the whole unit after that. To learn more about this filter, kindly visit our detailed review. If your water source contains high amount a fluoride, the Home Master TMJRF2 is one of the filters that you can consider. It removes up to 93% of the fluoride contained in the water. The Home Master TMJRF2 doesn’t just remove fluoride from your source water. The 3 stage water filter is consists of the following capability. Activated Alumina – Reduce arsenic and fluoride. Coconut Shell Carbon – Reduce VOC, Herbicide, Pesticide, and Chlorine. 5 Micron Compression Disk – Remove particles such as dust, sand, and dust. Furthermore, it retains healthy minerals such as calcium and magnesium in the water. Home Master is so confident about its product that it provides a 3-year warranty on the TMJRF2 while most system only comes with 1-year warranty. + Remove Fluoride from source water. – Short Lifespan filter with filter replacement occurs every 3 months. – Slightly expensive maintenance cost. Bottomline: If fluoride is one of the main contaminants that you wish to get rid of, this is the most affordable countertop water filter that will help you in removing it. Want to know more about the Home Master TMJRF2, check out our detail review now! 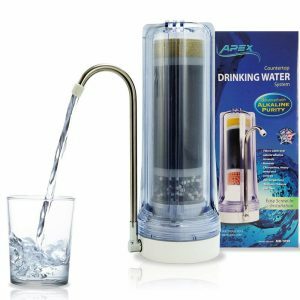 The APEX MR-1050 the only water filter in this category that produces alkaline water in a single canister filter. The first 3 stages are merely standard filtration system with sediment and carbon filters. What makes the APEX MR-1050 special is the last 2 stages of the filter. Alkaline Layer – Remineralized potassium and magnesium. Calcite Layer – Remineralized calcium. These two stages make the water remineralized with healthy minerals and increase the pH level of the water. Many experts claimed that alkaline water is beneficial in neutralizing the acidic food that we consume daily and neutralizing the free radical which can reduce aging. + The only alkaline countertop water filter in town. + While remineralizing the water, it removes city water contaminants such as chlorine. Bottomline: Alkaline water can be very expensive. Although you can change the pH of water coming out from this system, you can assure that the pH is 7 and above. To learn more about the APEX MR-1050, visit our thorough review of this filter. 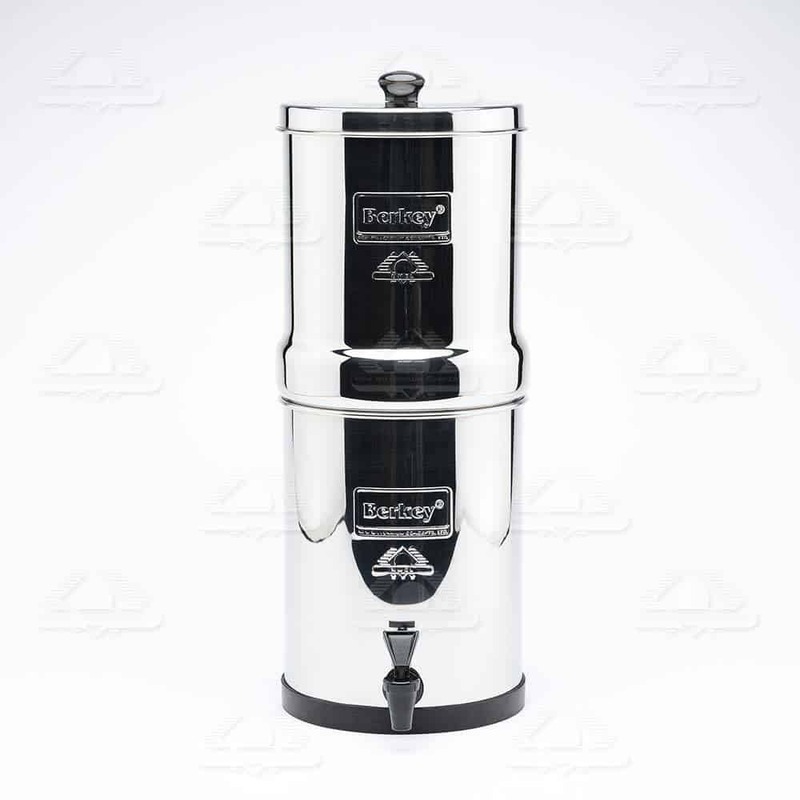 Berkey is one of the top gravity-fed water filters that are available in the market. Sadly that it is not available in Iowa and California due to the banned imposed by the two states. After a thorough understanding of the situation, we think that the banned is due to some regulatory request by the state which was unable to fulfill by Berkey due to hefty cost. We believe that it is still a great piece of water filter which shouldn’t be missed. Let’s dive deep into the Berkey system and understand why we think that it is that great. The foundation of Berkey systems is made up of two separate cartridges, the Black Berkey and the Fluoride Filter. Black Berkey: It is a microporous filter, which removes up to 99.9% on some of the contaminants that appear in the water. It was independently tested in the EPA-approved laboratory against NSF/ANSI Standards 53 to ensure the quality of the filter is being achieved. 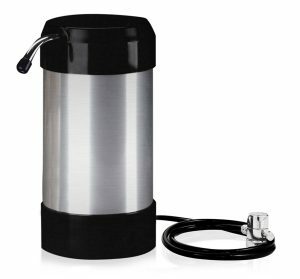 The Black Berkey is easily cleanable from time to time when the flow rate started to get low. This can prolong the lifespan of the cartridge. Fluoride Filter: Although it is named as a fluoride filter, it can do better than just removing fluoride. Besides fluoride, this system is able to remove Arsenic, which is one of the dangerous contaminants available in our water source. Apart from Arsenic, it removes MBTE and some other heavy metal ions. The combination of Black Berkey and Fluoride Filter, Berkey is capable of filtering the list of top 20 major contaminations shown below. 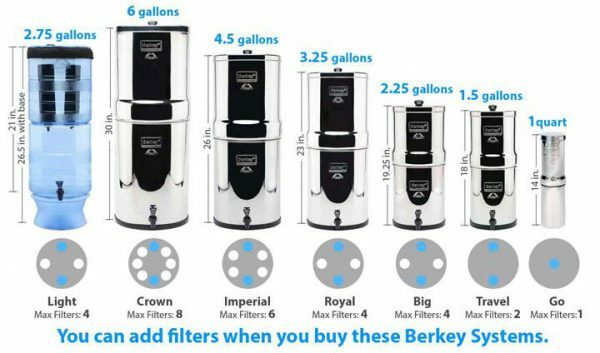 For a more in-depth list of contamination that is filtered by Berkey, kindly refer to this list. Besides the chemical contaminants, their filter also removes 100% of pathogenic bacteria. Generally, it is required to have a UV light sterilizer to remove the bacteria. There are different models of Berkey to cater to different needs. Take Berkey Go as an example, it is designed for hiking and traveling purposes with it’s small and compact size. While the Crown Berkey is suitable for small offices or huge household as it container can store up to 6 gallons of water at a time. 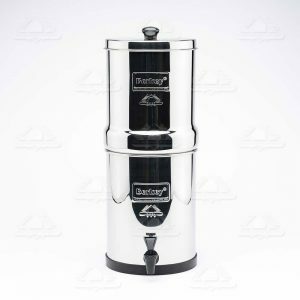 One of the best sellers is the Big Berkey, which is having an ideal size of 2.25 Gallons that is enough for a decent size family of 4. The Fluoride Filter is small in size. Hence, the lifespan is just about 1000 Gallons per pair or approximately 2 years for one set of replacement. When you register your Berkey, you will receive a Berkey Care Lifetime Warranty instead of the standard 6 months warranty. However, this only applies to Travel, Royal, Big, Imperial, and Crown Berkey. + Portable and doesn’t have any tubing or adapters. – Flow Rate is lower compared to the pressure-fed filter. – Expensive on the initial investment. Bottomline: It is great to see how Berkey can build such a simple filtration system while still capable of removing so many contaminants. Although the flow rate might be lower compared to the rest of the system, it is a great system that you will never regret. Check the latest price on my number one online trustworthy store, Amazon. Check out the top 3 most popular Berkey on the market. Click on the button to get the latest discounts and find out what people say about this system. Otherwise, please visit our detailed review of this system. After a thorough research on all the system, we only recommend those that worth every penny that you spent. With that said, you can certainly sure that the 6 countertop water filter above are top quality and reliable system. who is looking for a switch from faucet filter or water pitcher. who stayed in a place where city water is their source water. who are looking for affordable options for filtering your drinking water. who are renting an apartment which cannot be involved in heavy installation. The main reason for these recommendations is due to it does not require complicated installation procedure which involves drilling. Water contamination is getting worst these days across the country. In recent days, there are tonnes of news regarding unsatisfactory water conditions and deteriorate water quality. To overcome this issue, we need to have an additional filtration system for our drinking water before we consume it. Whatever that wasn’t filtered, will be filtered by you. Picking a water filter can sometimes be a hassle. You don’t really know which water filter is the best in the market. Well, sometimes the best isn’t right for you. Here are some guidelines for selecting the right water filter. The most important element of buying a water filter is to remove contaminants that exist in our source water. Do you know what are the pollutants that exist in your source water? One method is to look for your local Consumer Confidence Report. You should be receiving it on July 1st of every year. 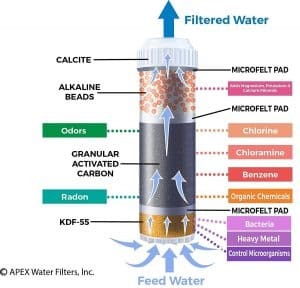 Search for several filters which filter the contaminants that you identify earlier. Do not settle for just one system. It will be a great determining factor if the system has an NSF or WQA certifications although it isn’t required. Besides removing the contaminants that you identify, it is always good that it will get rid of some other major contaminants such as chlorine, arsenic, mercury, and lead. These contaminants are deadly and should be removed for you and your family’s health. Is this filtration system falls within your budget? Some systems might be affordable at the initial cost but the filter replacement cost per year is twice as much as the initial cost. Never forget to check on the running cost. 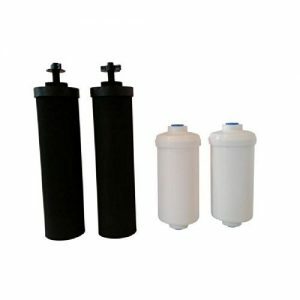 While some gravity-driven water filter doesn’t require installation, generally this type of water filter only required minimum installation. You just need to be sure that your faucet fits the adapter of the filter that you intend to purchase. If you purchase from Amazon, you can definitely return it within 30 days if the product doesn’t meet your expectation. It’s good to go through the reviews by existing customers so that you won’t be wasting your time on bad products. It is certainly not a hard rule to follow the guideline above in order to own a countertop filtration system. It is just a recommendation. Based on the 6 best countertop water filter that we recommend, which one suits your house? Or you are still looking for a greater system? If you are a homeowner, we do suggest that you go for the under sink water filter. It has more features and capability in removing contaminants in rigorous conditions. There are more choices and the annual maintenance is lower. Check it out now!